Our core mission is to encourage citizens to develop skills necessary to navigate public space better and participate more effectively in public life. Civic Education Centre (COV) was established in 2009 under the auspices of Masaryk University in Brno with initial financial support from the Ministry of Education, Youth and Sports. In 2014 the Centre moved to Charles University in Prague. Civic Education Centre is a non-partisan institution founded to help build long-term concepts and strategies for civic education in the Czech Republic. Since the Velvet revolution in 1989, civic education has not been considered important and barely existed, largely a consequence of the ruling party’s antidemocratic policies during the Cold War. One legacy of that regime is a deep-rooted scepticism of the public against education in political issues. However, a functioning democracy needs its citizens to be educated in the mechanics of democratic process and the workings of democratic institutions. A host of non-profit organisations and remarkable projects are already actively promoting civic education in the Czech Republic. Unfortunately, many of them only address specific issues and have little prospects for long-term sustainability. 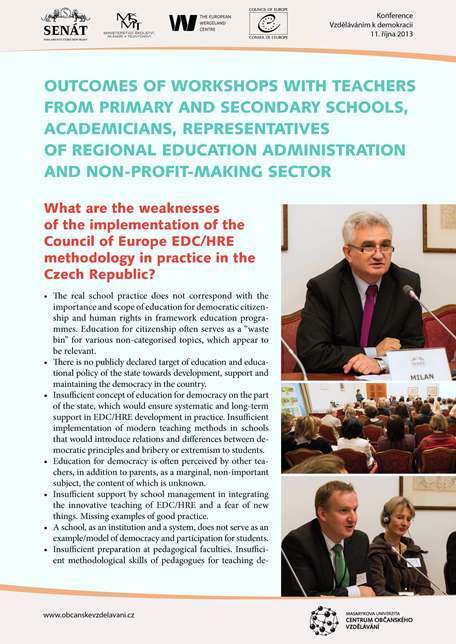 It is the Centre’s task to assume a coordinating role and actively support the introduction of a comprehensive civic education concept in the Czech Republic. To achieve this, the Centre closely cooperates with already involved actors – NGOs, government institutions, universities. The Centre publishes analyses and reports on civic education and sets benchmarks and standards for evaluation. Where needed, the Centre realises its own projects. The Centre is building a network of partners in the Czech Republic, mostly NGOs and think-tanks, and is open to cooperation with international partners. International collaboration should provide a platform for a fruitful exchange of experiences as well as adoption of interesting projects from abroad. At the level of IDENTIFICATION we are providing analysis of the educational needs in long-life development of the civic skills. At the level of IMPLEMENTATION we are providing training courses, seminars, conferences etc. All formal, non-formal and informal types of civic education. Courses offered through our own services or through certified partner organizations. At the level of EVALUATION we are offering a complete evaluation of educational programs for schools, educational institutions and public authority. We provide methodological materials for teaching civic issues in schools. We translate methodological guides of the Council of Europe concerning civic education. We organize courses and conferences for schools and the public on issues of civic education. We provide specialized analysis and research on issues of citizenship, civic education and social literacy. We focuse on advocacy of conceptual support for the development of civic education on the political level. We provide methodological support for schools and educational institutions in the development of civic skills. Decentralization of civic education activities. Support to community-based initiatives and non-governmental organizations. Increasing radicalization and extremism in society. Civic education at formal education. Searching positive role models in society. Evening with Ombudsman - Empowering rural communities through knowledge on fundamental rights. In an analysis of civic education for adults, Civic education centre defined civic education in the context of Czech Republic and identified programs aimed at adult population. The analysis revealed that programs aimed directly at developing civic competences among adults are virtually absent. Most programs fall into the category of the vocational or leisure education. But a democratic society needs a long term strategy of civic education at all levels, and the Czech Republic is no exception. The study proposes a list of policies to support and develop civil society, including adequate and sustained financial support for civic education programs. Researchers at the Civic Education Centre are conducting a similar analysis of civic education in primary and secondary schools. The study will define key concepts, identify current activities and programs, introduce key actors, and propose a strategy for future development of this area. Apart from that, the study will provide a strong theoretical insight into forming and realizing civic competences. Among the primary sources are experiences and learning outcomes of a two-year project in teacher training. The Centre has partnered with the Centre for Democratic Education (CEDU) to produce publications inspired by the International Framework for Education in Democracy Res Publica, published by Center for Civic Education in CA, USA. The Centre is also translating and adapting core materials on civic education, including the Education for Democratic Citizenship and Living Democracy packs published by the Council of Europe. The translations are supported by the Ministry of Education, Youth and Sports and the Embassy of the United States, Czech Republic. The Centre is developing a comprehensive training program in civic education for teachers of primary schools, high schools and vocational schools. A cohort of 78 teachers from 39 schools from all regions of the Czech Republic, will graduate from the program and apply their new knowledge in their classes and further cooperate with the Centre in transferring lessons learned. The teachers will also share their experiences using a unique web-based information exchange platform. The creation of this program is a collaborative endeavour involving the entire civic education network, which comprises of 12 coordinators covering all regions of the Czech Republic and 5 core staff of the Centre. The creation of this network and the project itself were made possible through funding from the European Union Social Fund, Operational Programme ‘Education for Competitiveness’. Does COV have any role models abroad? In defining is mission and areas of activity, COV was inspired by a number of institutions in other countries. Civic education is institutionally established in all traditional western democracies. Although the Centre’s resources are still quite limited, we aspire to institutions like Bundeszentrale für politische Bildung in Germany (www.bpb.de), ProDemos in the Netherlands (www.prodemos.nl), Center for Civic Education in USA (www.civiced.org) and the like. The centre is fully integrated into european NECE network. COV was launched with initial support from the Ministry of Education, Youth and Sports. Currently it is financed by grants (including the European Social Fund) and by providing consultancy and expert services. Who is COV partnered with?